Time management is very important to run any organization smoothly. Teachers usually spend a lot of time in timetable management. 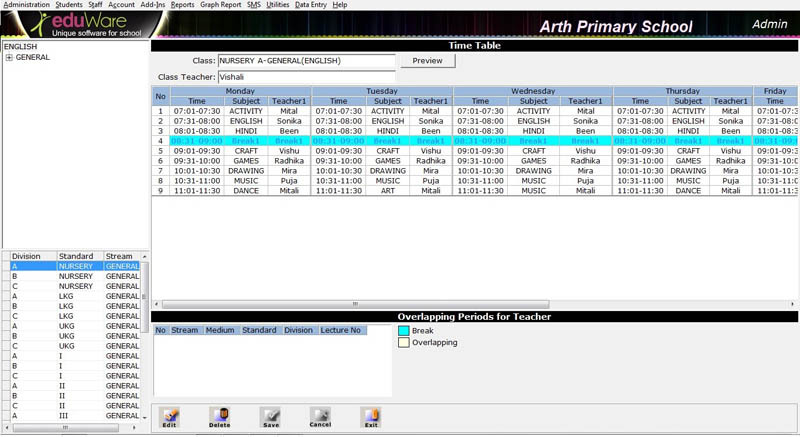 The timetable is a basic entity to create and manage schedules in school. The school timetable software provides efficient, customized time table schedule for school time and examination time. eduWare provides things like shift information and lecture duration pre structure. Generate schedules for all staff members for various classes of associated courses on a particular day and periods. Changes can be easily made in the timetable when necessary situation. The eduWare school software directly connects with our online web portal so parents and students can be seen time table of school and exam schedules any time.